Jewish Facts From Portland: Iranian Deal Reached: Is It Good For the Jews? A deal with Iran has been signed which affects the next 6 months. It's not a great deal, not a good deal, but a deal whereby we have unloosened sanctions that we'll never get back. Pundits were talking about how hard they were to get in the first place. We had people like Russia and China that had to come to agreement with England, France, USA and Germany. One pundit described their nuclear plans like baking a cake. They still have all the ingredients to make it. They can wait for 6 months. Obama spoke from 7:33 pm to 7:41 pm, all of 8 minutes. He was late as usual in coming to the mike. Kerry spoke for a much longer time. Obama thinks more about politics and wanting to leave one legacy of something he brought about. After 5 days, they finally got this signed in Geneva, Switzerland. Iran has been in operation of starting a nuclear program for the past 10 years. One thing we were all listening for was what was going to be done with enriched material they have on hand. The second thing of interest was about the centrifuges. In 2003 they had 164 centrifuges. Today they have 19,000 centrifuges. If these are destroyed, they can always make more. The third thing is about their plutonium reactor they have in Iraq. What about that? The most important thing is the ability to verify what they say. Iran has done nothing but lie about their capabilities. They can pretend to drop the program but keep on doing it. Evidently the European Union will be very happy to have this agreement as they are chomping at the bit to trade with Iran. There's money to be made. Iran gets a lot, in the billions. Iran will get 6 to 9 billion dollars in relief. The relief will be in the form of being able to retrieve gold and petrol dollars, for example. They have had their economy hobbled by the sanctions so will get something like 4.2 billion in aid in foreign currencies, and 6 to 10 billion in the next 6 months because they will only continue with their enrichment program by 3.5%. Inspectors will be able to keep tabs on their work daily through cameras, I believe they said. That worried me right away after watching our American TV programs on Law and Order. Cameras can be set to show what the person owning the cameras want to show. I hope I was hearing wrong. What Iran was fishing for and got was to be active in a role pertaining to Syria, for one. Probably they want to be in on the Palestinian talks and Israel talks, too, though nothing else was mentioned beyond Syria. They are hungry for power. We do have people who are sceptical besides me. Major General Bob Scales remembered the deal with North Korea when Clinton was the President. . He also thought the bones of the deal should be kept in place and not to make cosmetic concessions. Saudi Arabia and Israel and others will not be resting comfortably with this deal. It may impede Iranian progress but it isn't stopping it. Kerry thinks they would wind up with nothing evidently if they didn't take this opportunity. This is Western thinking dealing with an old easterner. A pundit mentioned the fact that Israel and Saudi Arabia have intuitive feelings about this and have dealt with the the Middle East much more than our Western contingent with Kerry and they should be listened to. No, the deal is not good for the Jews. A good deal would be to dismantle their program. Netanyahu said that Kerry gave up too much. I knew he'd do that. He's never bartered in a shuk. You don't pay the first price asked. Evidently he had had it after 5 days of meetings. 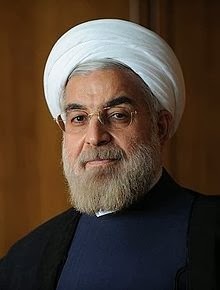 Iran said they had no plans to destroy Israel and that there is a fatwa against that, but at the same time their religious leaders, mullahs, were calling Israel such pet names as stinking dogs and pariahs. This, coming from religious leaders doesn't offer much comfort and trust. Ahmadinejad did so much lying. People on this team cannot count on trusting what they hear. Seeing is believing. They must verify everything. Did they bring about any dismantling of the centrifuges? No. The Plutonium? No. We'll just have to see what's happening in around June the 1st.